The dark web actually has promise. In essence, it’s the World Wide Web as it was originally envisioned. Looking beyond the scaremongering, however, the dark web actually has promise. In essence, it’s the World Wide Web as it was originally envisioned: a space beyond the control of individual states, where ideas can be exchanged freely without fear of being censored. As countries continue to crack down on the web, its dark counterpart is only going to become more relevant as a place to discuss and connect with each other. We shouldn’t let the myth of the dark web ruin that potential. Hello,We represent the Saint Joseph University of Beirut, Lebanon and we would like to kindly ask you to forbid access to both our IPs (we are sure you can find them otherwise contact us to provide them to you) to the website libgen.org.We have included you in our restricted list in the institution firewall, but students have found ways to bypass it. We hope you could make it radical from your side.Please note that many students have been severely punished for using this website. We are only asking for this, in order to spare the others.We pay yearly subscriptions to many Editors and hope to stay “legal”. We appreciate all your efforts and respect them. We hope to come to an understanding together.Thank you very much.Hoping to hear from you very soon.PS: Move this thread to where it should be if needed, we couldn’t find an appropriate thread for such a request. A new story published on the German site Tagesschau and followed up by BoingBoing and DasErste.de has uncovered some shocking details about who the NSA targets for surveillance including visitors to Linux Journal itself. While it has been revealed before that the NSA captures just about all Internet traffic for a short time, the Tagesschau story provides new details about how the NSA’s XKEYSCORE program decides which traffic to keep indefinitely. XKEYSCORE uses specific selectors to flag traffic, and the article reveals that Web searches for Tor and Tails–software I’ve covered here in Linux Journal that helps to protect a user’s anonymity and privacy on the Internet–are among the selectors that will flag you as “extremist” and targeted for further surveillance. If you just consider how many Linux Journal readers have read our Tor and Tails coverage in the magazine, that alone would flag quite a few innocent people as extremist. While that is troubling in itself, even more troubling to readers on this site is that linuxjournal.com has been flagged as a selector! DasErste.de has published the relevant XKEYSCORE source code, and if you look closely at the rule definitions, you will see linuxjournal.com/content/linux* listed alongside Tails and Tor. According to an article on DasErste.de, the NSA considers Linux Journal an “extremist forum”. This means that merely looking for any Linux content on Linux Journal, not just content about anonymizing software or encryption, is considered suspicious and means your Internet traffic may be stored indefinitely. via NSA: Linux Journal is an “extremist forum” and its readers get flagged for extra surveillance | Linux Journal. As Turkey prepares for elections on Sunday, Turkish Prime Minister Recep Tayyip Erdoğan continues to double down on Internet censorship. A week after Turkish ISPs blocked Twitter Turkey’s telecommunications authority has blocked YouTube. The block began to be rolled out hours after a leaked recording published anonymously on YouTube purported to show a conversation in which Turkey’s foreign minister, spy chief, and a top general appear to discuss scenarios that could lead to a Turkish attack against militants in Syria. The fallout from the Erdoğan government’s censorship spree has not been limited to platforms that host embarrassing political content. When Turkish Internet users handily circumvented the original Twitter block by using Google’s DNS servers, Google’s DNS was itself blocked. Now it appears that just as Turkey’s ISPs are rolling out a block on YouTube, they are also blocking access to the Tor Project’s website, where users can download the Tor Browser Bundle. The Tor browser is a powerful tool in the censorship circumvention toolbox because it is exceptionally difficult to filter Tor traffic. via When Is a Tor Block Not a Tor Block? | Electronic Frontier Foundation. The Government of Antigua is planning to launch a website selling movies, music and software, without paying U.S. copyright holders. The Caribbean island is taking the unprecedented step because the United States refuses to lift a trade “blockade” preventing the island from offering Internet gambling services, despite several WTO decisions in Antigua’s favor. The country now hopes to recoup some of the lost income through a WTO approved “warez” site. via Antigua Government Set to Launch “Pirate” Website To Punish United States | TorrentFreak. The beauty of P2P and BitTorrent is that it’s a distributed system. Indeed, as far as sites are concerned bandwidth between users (and of course content) are both available for free and running in basic mode requires only a few dollars a month on top to pay for a server. Trading in the big gas guzzler for a something a little more frugal should be a survival option. Of course, in many cases this could potentially mean file-sharing backing up in sophistication to 2004, to what may as well be the stone age to many of today’s younger enthusiasts. That said, ask anyone who was around at the time if it was so bad. Yes, at times Suprnova required 30 refreshes until a page actually loaded and yes, initial seeders uploaded at a snail’s pace, but the scene was buzzing and people were having fun. And if it’s not about having fun anymore, something has gone wrong along the way. Maybe a fresh start and a resurgence of some old fashioned non-monetary gain values is what is needed. The money can’t be targeted if there isn’t any. via Bombing BitTorrent and File-Sharing Websites Back to the Stone Age | TorrentFreak.The beauty of P2P and BitTorrent is that it’s a distributed system. Indeed, as far as sites are concerned bandwidth between users (and of course content) are both available for free and running in basic mode requires only a few dollars a month on top to pay for a server. Trading in the big gas guzzler for a something a little more frugal should be a survival option. via Bombing BitTorrent and File-Sharing Websites Back to the Stone Age | TorrentFreak. Textbook Publisher Pearson Takes Down 1.5 Million Teacher And Student Blogs With A Single DMCA Notice | Techdirt. In case you don’t already know, we’re the folks not only behind this site andWPMU DEV, but also Edublogs… the oldest and second largest WordPress Multisite setup on the web, with, as of right now 1,451,943 teacher and student blogs hosted. And today, our hosting company, ServerBeach, to whom we pay $6,954.37 every month to host Edublogs, turned off our webservers, without notice, less than 12 hours after issuing us with a DMCA email. Because one of our teachers, in 2007, had shared a copy of Beck’s Hopelessness Scale with his class, a 20 question list, totalling some 279 words, published in 1974, that Pearson would like you to pay $120 for. Putting aside for a moment the fact that Pearson somehow feels that a 38-year-old questionnaire is worth $120, and the fact that the targeted post was originally published in 2007, there’s still the troubling question as to why ServerBeach felt compelled to take down 1.5 million blogs over a single DMCA notice. There’s nothing in the DMCA process that demands an entire “ecosystem” be killed off to eliminate a single “bad apple.” This sort of egregious overcompliance gives certain copyright holders all the encouragement they need to continue to abuse the DMCA takedown system. Textbook Publisher Pearson Takes Down 1.5 Million Teacher And Student Blogs With A Single DMCA Notice | Techdirt. Today we are beginning to see the first signs of Google’s announced punishment of “pirate” websites. 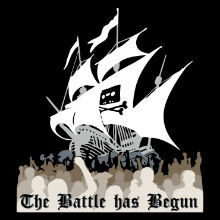 The changes are resulting in lower search rankings for many file-sharing sites, but that doesn’t seem to bother The Pirate Bay. They are, however, disappointed that Google is giving in to the demands of the entertainment industries. The owner of fellow BitTorrent site isoHunt has gone a step further with a call for protest against antitrust bullying and censorship. via Pirate Bay and isoHunt Respond to Google Search Result Punishment | TorrentFreak.Today we are beginning to see the first signs of Google’s announced punishment of “pirate” websites. The changes are resulting in lower search rankings for many file-sharing sites, but that doesn’t seem to bother The Pirate Bay. They are, however, disappointed that Google is giving in to the demands of the entertainment industries. The owner of fellow BitTorrent site isoHunt has gone a step further with a call for protest against antitrust bullying and censorship. via Pirate Bay and isoHunt Respond to Google Search Result Punishment | TorrentFreak. According to the Federal Court, RapidShare has to take all “technically and economically reasonable precautions” without compromising its business model to ensure that its users do not upload Atari’s game. The Court also noted that by not installing a word filter RapidShare may have already breached the “reasonable” threshold.One of the additional steps that the Court said RapidShare must take is to monitor a “manageable number” of third-party sites that offer “link collections” of content available on RapidShare. Should it find them indexing a copy of Atari’s game available on RapidShare it should then delete it from its servers. via Supreme Court: RapidShare Liable For Copyright Infringement – Sometimes | TorrentFreak.According to the Federal Court, RapidShare has to take all “technically and economically reasonable precautions” without compromising its business model to ensure that its users do not upload Atari’s game. The Court also noted that by not installing a word filter RapidShare may have already breached the “reasonable” threshold.One of the additional steps that the Court said RapidShare must take is to monitor a “manageable number” of third-party sites that offer “link collections” of content available on RapidShare. Should it find them indexing a copy of Atari’s game available on RapidShare it should then delete it from its servers. via Supreme Court: RapidShare Liable For Copyright Infringement – Sometimes | TorrentFreak. The benefits of being on Facebook are fairly obvious by now: you can connect to friends and family and share things with them no matter where they are — and it’s all free! This quasi-public space is also owned and controlled by a corporate entity, however, and it has its own views about what kinds of behavior should be allowed. That inevitably raises questions about whether the site is engaging in what amounts to censorship — questions that resurfaced this week after a page belonging to film critic Roger Ebert disappeared, and a group of protesters in Britain found their content blocked. Who is watching the watchmen? via The downside of Facebook as a public space: Censorship — Tech News and Analysis. Anti-censorship campaigners compared the plan to China’s notorious system for controlling citizens’ access to blogs, news websites and social networking services.The proposal emerged an obscure meeting of the Council of the European Union’s Law Enforcement Work Party LEWP, a forum for cooperation on issues such as counter terrorism, customs and fraud.“The Presidency of the LEWP presented its intention to propose concrete measures towards creating a single secure European cyberspace,” according to brief minutes of the meeting. via Alarm over EU ‘Great Firewall’ proposal – Telegraph. According to 4chan’s Twitter account and status update blog, they have been “explicitly blocked” by the Verizon wireless network.